Xu Lele is a Chinese artist who is a part of the New Scholar School – artists who sought to make the venerable Chinese literati painting tradition relevant in the modern period. She was born in Nanjing, Jiangsu. In 1973, she enrolled at Nanjing University of the Arts to study Chinese painting. After graduating in 1976, Xu lived in rural Jiangsu, where she created many artworks that drew on her experiences. In 1978, Xu became a professional painter at the Jiangsu Chinese Paintings Academy. Her portraits and traditional Chinese story-telling picture books have received numerous national and international awards. Xu Lele’s works are filled with a carefree but candid feeling and are often humorous and vivid. She received a strict traditional training in technique, but does not intentionally pursue a classical or ancient feeling in her work. Her traditional training gives her the ability to perfectly integrate traditional Chinese realistic and freehand painting techniques. 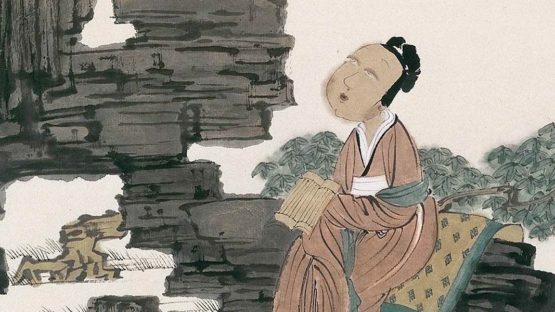 Her paintings owe their style to the famous Ming dynasty painter Chen Laolian, simple in technique but deep in meaning, and yet also incorporate a naughty and charming feminine touch. Xu uses few brush strokes, but the image those few strokes create are exaggerated and innocent. Yet at the same time, she uses tremendous patience to portray details such as Buddhist praying mats, boat canopy, plantain leaves, bamboo curtains, and even the peony flower design on court ladies’ skirts. This way of emphasizing the secondary or insignificant over the primary constitutes her characteristic painting style. The LE in Xu Lele’s name literally means joy, and as with her name, Xu Lele’s paintings strive to create joy, every painting being oriented towards a carefree, contented lifestyle. She once said, “even if one is not the greatest painter, one’s paintings should still be interesting.” In fact in the world of Xu Lele’s art, everyone, whether court lady or literatus, lives in a childish world in which laughter might erupt at any time. The feeling is jocular, humorous, and jubilant. Under the traditional dresses of the painting’s figures lies bewilderment and a bit of perplexity, yet the figures are not sorrowful. Even if they are in the process of searching, they are not anxious. Worth note is that while the painting seems to be painted in whimsical strokes, it is precisely these whimsical strokes which give the painting an atmosphere of spontaneity and freedom. This is representative of the painter’s wise and penetrating insight into life. She is currently a professional painter for the Traditional Chinese Painting Institute. Xu Lele lives and works in Jiangsu.